Although, the growth in Mobile telephony has been stupendous in India over past 5-6 years, same cannot be said about broadband. The growth in broadband subscribers has been at snail’s pace. Mobile telephony spread across length and breadth of India, thanks to cheap handsets and even cheaper call rates. Unfortunately, broadband could not reach the masses due to higher prices, lower speeds, infrastructural issues among other reasons. 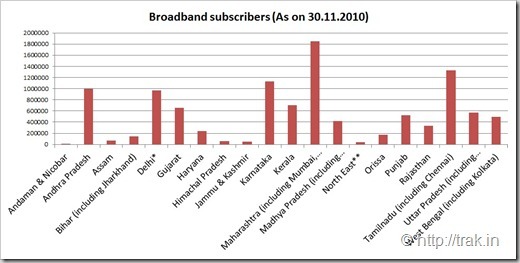 Even today, India’s broadband density is miniscule 1 percent with majority of subscribers in Urban cities only! Bringing Internet connectivity to masses, especially in rural areas, is one of the key goals and Indian Government envisages to cover 2,50,000 village panchayats with broadband by 2012. Currently, only about 97,548 villages are covered with broadband. In a recent press release, Government has released State-wise broadband subscribers including urban and rural areas Circle-wise connections. Hero group to spend 100 crore in rebranding to shed Honda Tag!